KARACHI: A high-level investigation committee tasked to probe the allegations of sexual harassment have pronounced the vice-chancellor and lecturer of Shaheed Benazir Bhutto University (SBBU), Nawabshah, as innocent, it was learnt on Monday. The Sindh government had constituted a high-level committee under the chairmanship of Prof Dr Abdul Qadeer Rajput. Universities and Boards Department Deputy Secretary Sohail Anwar Baloch, Naushehro Feroz Deputy Commissioner Anwar Sher and the University of Sufism and Modern Sciences VC Prof Dr Parveen Munshi were also made part of the committee. The committee was tasked to probe the complaint of a female student, Farzana Jamali, against the SSBU vice chancellor and lecturer. Jamali had revealed that a lecturer namely Aamir Saeed Khattak had long been subjecting her to sexual harassment that almost compelled her to commit suicide however she didn’t. According to Jamali, her studies were badly affected while her family was under immense pressure from the authorities concerned to withdraw from the allegations. “The administration put my father behind the bars for raising voice against the university mafia under the supervision of vice chancellor Arshad Saleem”, she added. The committee members met on September 6 and 7 in the library of the university to decide the fate of the issue. 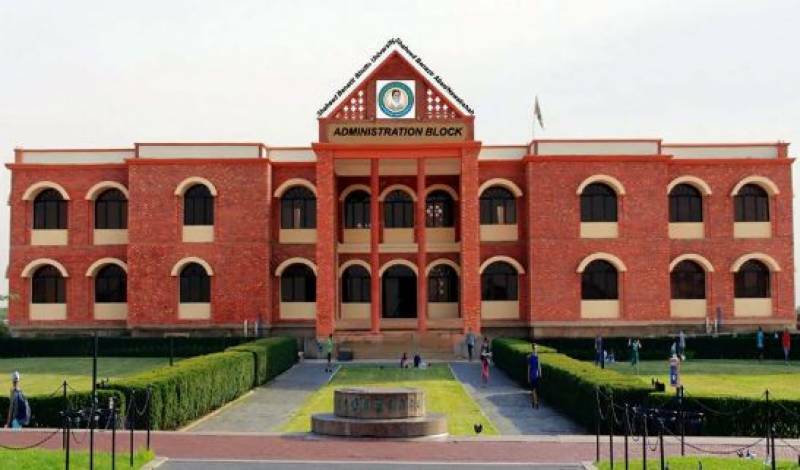 According to the findings of the committee, students had complained about harsh the behaviour of lecturer Aamir Khattak, with most female students feeling comfortable in his presence. Perhaps these incidents could have been normalized if the management had acted upon with maturity, the committee said. “In order to build the image of the university and confidence of parents, vice chancellor should come to the forefront and resolve the issue immediately. A statuary body should be framed and be active to resolve such issues within time,” the report said. “Officers such as deans, chairpersons, registrar, controller of examinations and director of finance should be appointed on regular basis instead of ad-hoc basis. Counselling services (males and females) should be introduced into the university to avoid such incidents. Sexual Harassment Committee, which already exists, should play its active role to mitigate such issues,” the report added. The committee, after recording the statements of Jamali, her father as well as the VC and lecturer, interviewed several classmates of Jamali and faculty members of the university as well. “The case is not related to sexual harassment as no such evidence was found,” the report suggested. The report attributed Jamali’s allegations to her reaction against the strictness of the lecturer in making his students to observe regularity and punctuality. Moreover, Jamali had remained absent for seven out of 15 days which appeared unacceptable to the lecturer, who was known in the university for his strictness. The committee recommended that the VC was essentially required to play his due role in instantly resolving the issue so as to save the university’s image from getting damaged and help regain the confidence of its students’ parents.